Forever etched in our memories as the site where visitors from Earth first set foot upon the Moon, the Sea Of Tranquillity ("Mare Tranquillitatis" in Latin) is the premiere lunar real estate location. While noted primarily for its historical significance, the northwest Tranquillity region also features incredible terrain that includes the Crater Jansen group, as well as craters Cajal and Sinas. In addition to the nearby Apollo 11 landing site, the Ranger 8 and Surveyor V unmanned missions also touched down in Tranquillity. Also nearby is the Sea Of Serenity, to the north of Tranquillity. 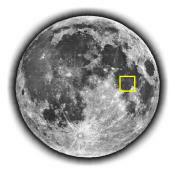 For location detail, please see The Full Moon Atlas, Sector D-5 (Central Mare Tranquillitatis). PROPOSED ZONING: Tourism (T-1), Scientific Industrial (S-1) and Commercial Industrial (C-1).